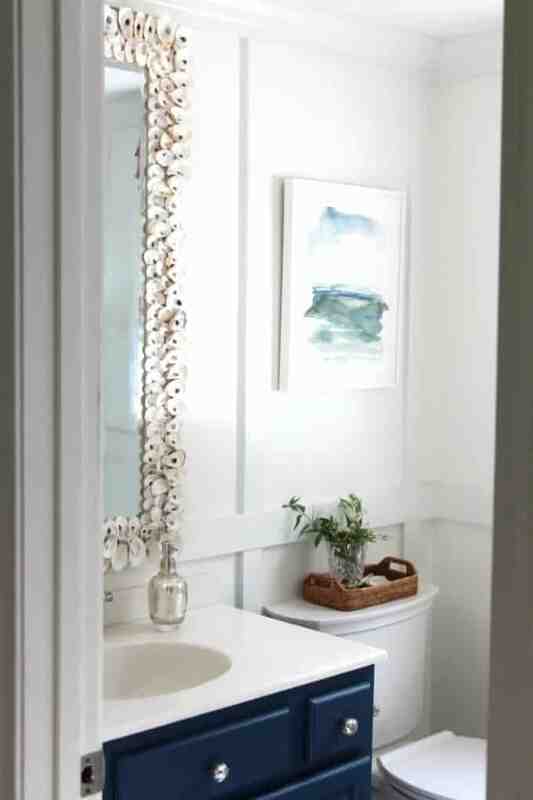 Thank you all so much for your kind words about our coastal bathroom remodel last week! You’re really all the nicest people on the planet and sharing a room renovation with you makes it so much more fun!! 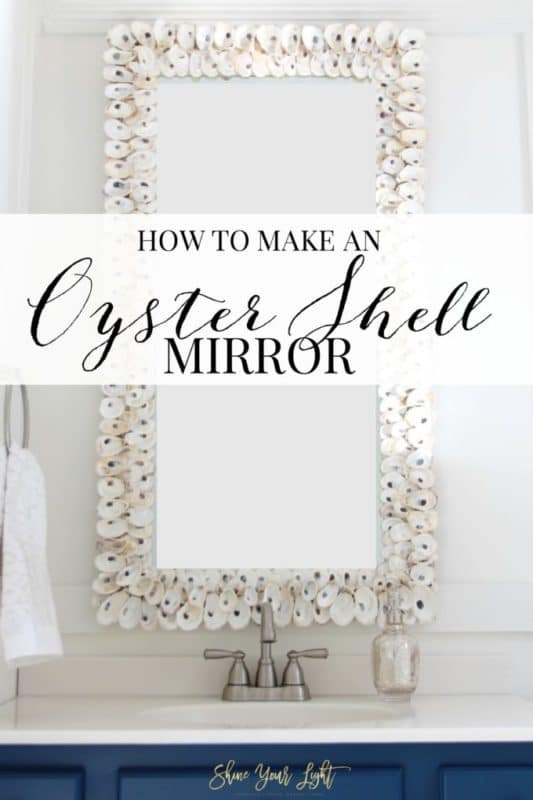 Today I’m back to show you how I made the oyster shell mirror. 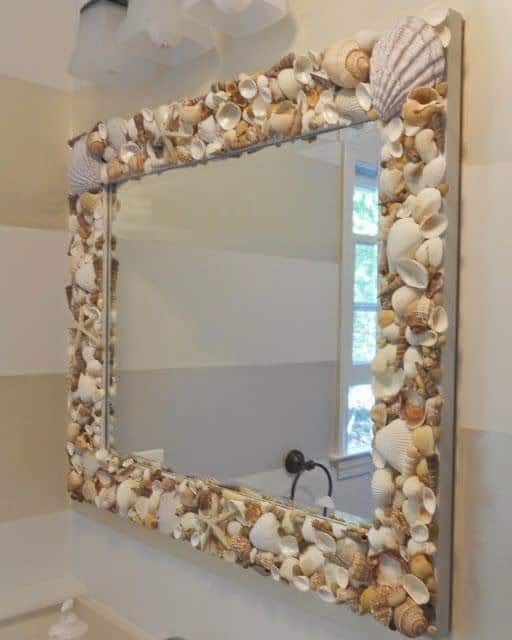 A few years ago I took all the shells collected on our family vacations to Sanibel and Captiva Islands in Florida, and our own Cape Cod and Rhode Island beaches, and made this shell mirror for our master bathroom. I wanted it to have a “washed ashore” look and since a lot of New England beaches are quite pebbly or rocky I used little stones in there too. As soon as it was hung I immediately regretted not making it vertical so I could use it in my living room. I have been completely enamored by this beautiful mirror for, like, ever, as well as the discontinued Ballard Designs one. 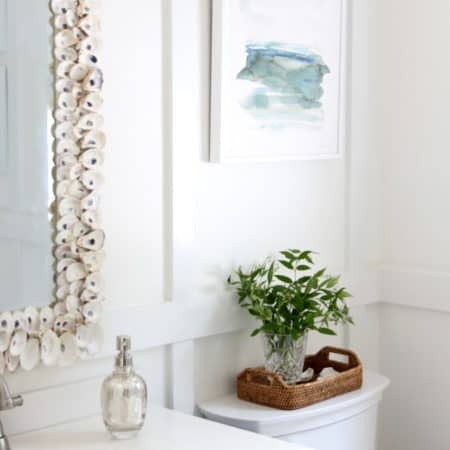 But ONE shell mirror in your master bathroom is one thing – TWO shell mirrors in a house?? When you don’t even live by the shore? That’s a little kitschy, right? Right. But you know what – WHO CARES?? Not me. 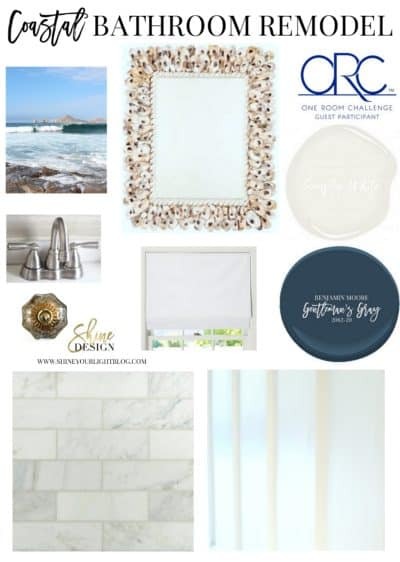 Especially when I started playing around with a design for the bathroom off our kitchen and it was just begging for an oyster shell mirror! I’m so glad I made another one even if I’m starting to get a reputation for being the crazy shell lady! 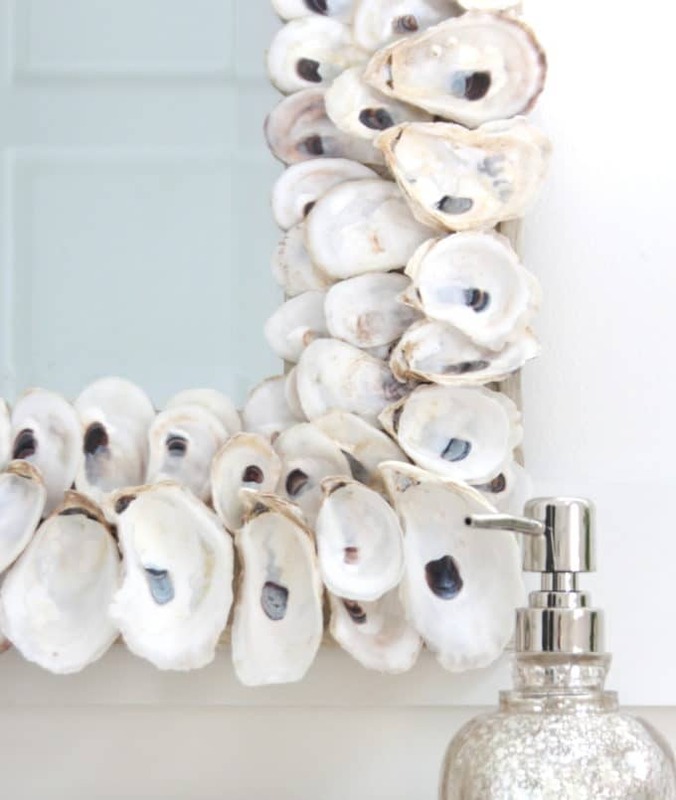 make an oyster shell mirror to enjoy all year long! Affiliate links are included in this post for your convenience; you can read about affiliate links right here. 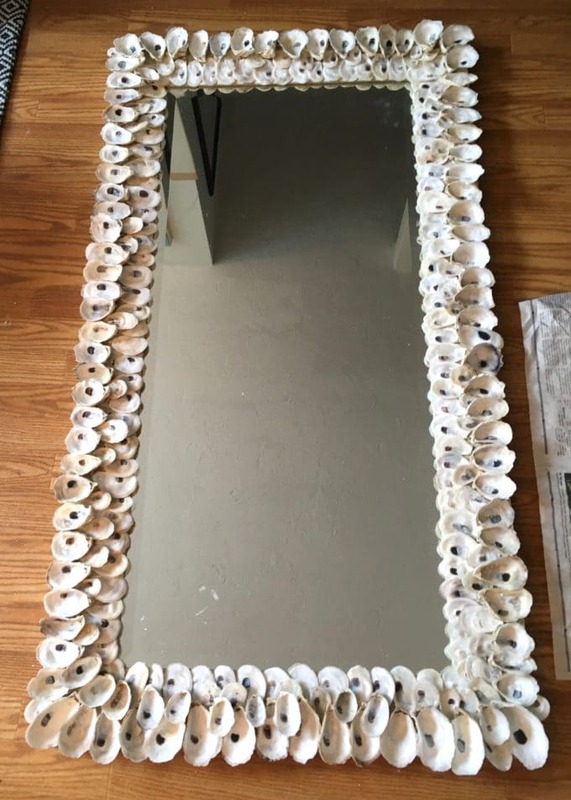 The first time around, I glued shells to a mirror with a hot glue gun. 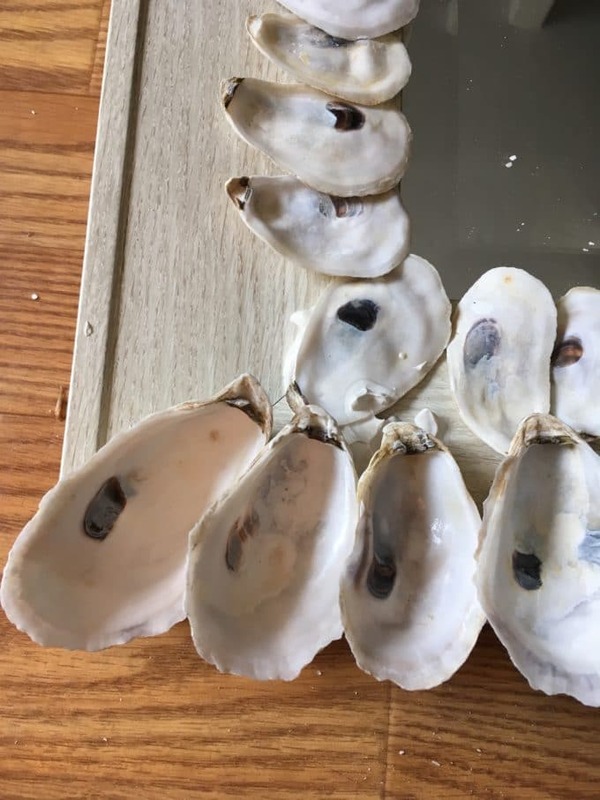 For the most part they have stayed put (I want to take out the big shells in the top corners but those suckers are clinging on there LIKE IT’S THEIR JOB), but between the humidity from the shower and warm weather, and the cold of New England winters, maybe 10% of them have fallen off. I’ve done some research and tried a few other recommended glues to reattach them (E6000, Aleene’s Tacky Glue, Gorilla Glue) and they work fine, however I have a new favorite….. Recently I read that regular old Liquid Nails works really well with shell crafts, which made a lot of sense – if you’ve ever tried to remove trim work attached with Liquid Nails you already know how it cures – it’s hard to rip anything apart that is stuck together with this adhesive. 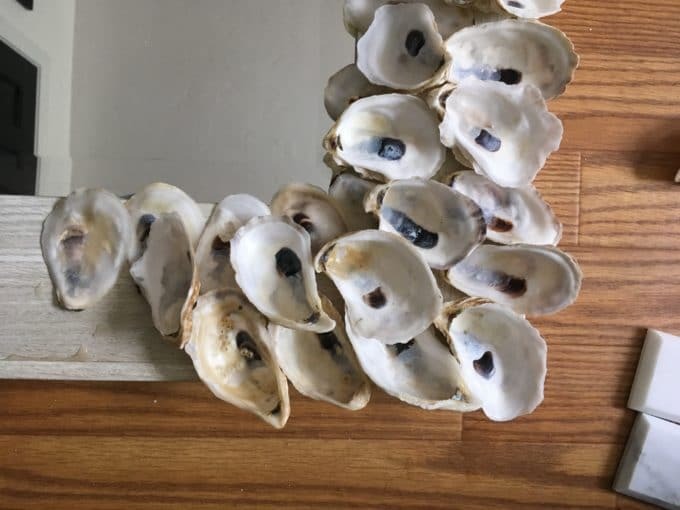 Since I already had a fresh tube of LN in the caulk gun from the bathroom carpentry, I used it for the oyster shell mirror, and so far I am really happy with how well the shells are attached – they are almost impossible to remove once cured. Also, dispensing Liquid Nails with a caulk gun is definitely the easiest application, and it’s the cheapest option at less than $2 for a big tube. Definitely a steal compared to other options. 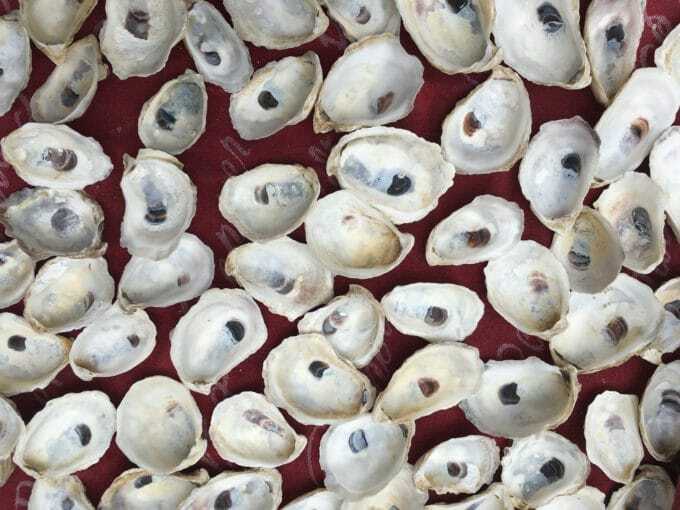 collect oyster shells and clean them yourself. 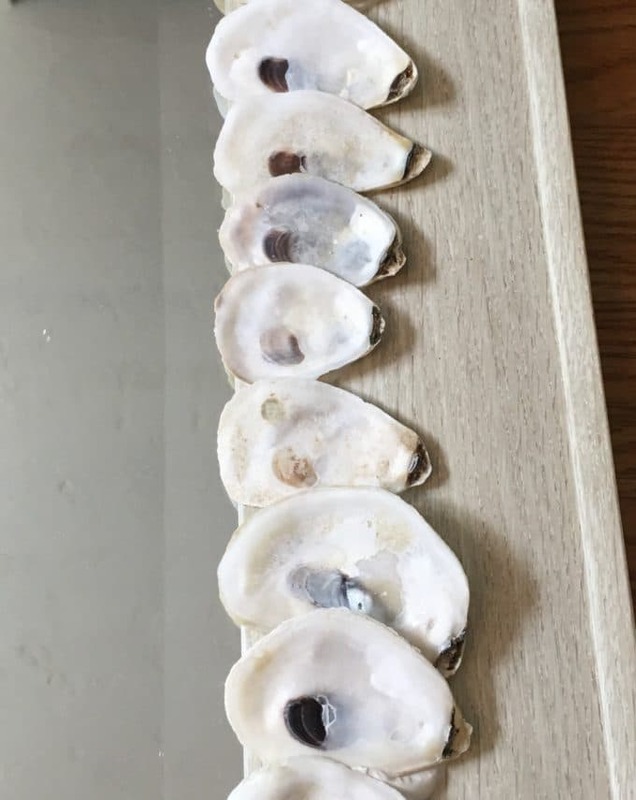 My niece and her fiancee who live on Cape Cod got me a bucket of shells that were shucked and ready to be cleaned. 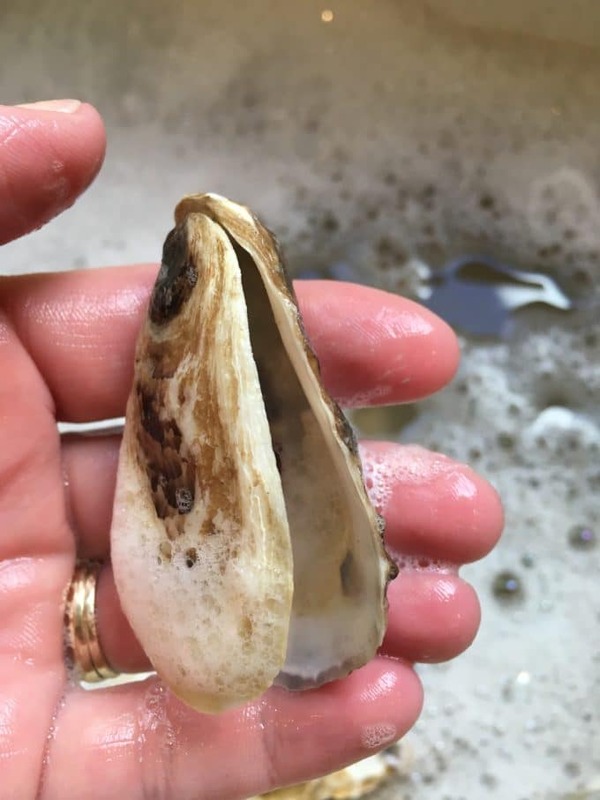 Most of the shells I’ve collected over my lifetime on beaches have been washed clean by the ocean, but if you are using oyster shells they will likely need to be scrubbed (and deodorized!) before you use them. This part is a little labor intensive but so worth the effort! 1 | HOSE DOWN THE SHELLS. If you have access to a hose, I strongly recommend you dump out the shells and give them a good strong spray to remove the sand as they will probably be pretty mucky. 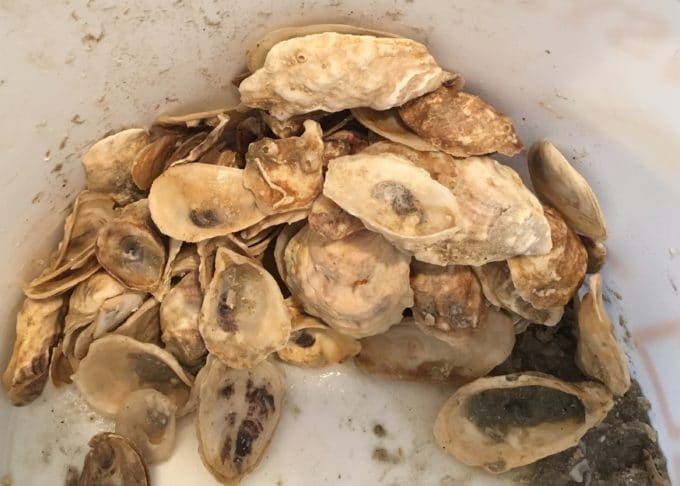 Some of your shells might still be inhabited with oysters or their friends may have come along for the ride, hence the “low tide on a hot day” smell!! 2 | DISINFECT/DEODORIZE/BRIGHTEN. 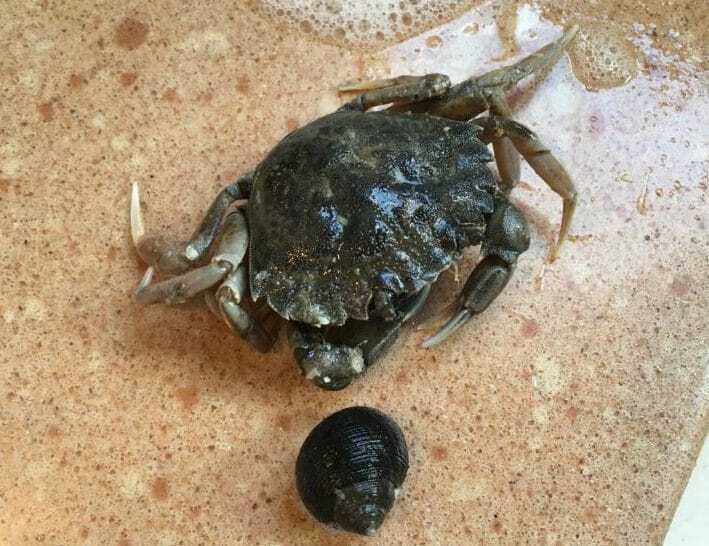 Place the shells in a large bucket and fill with diluted bleach* (about a 1/2 cup of bleach per gallon of water depending on how many shells you have – you can just eyeball the ratio). Let the shells soak for at least an hour. I actually soaked mine for a couple days until I had a chance to work on them. *I use bleach very sparingly. If you prefer not to use it at all, white vinegar is a great substitute for cleaning, deodorizing and whitening. 3 | SCRUB. This part is time consuming but will be so worth your time and energy!! Drain the diluted bleach or vinegar. Fill the bucket with warm soapy water and use a nylon brush to scrub the inside of the shells. I strongly suggest using a big bucket for this step and not your kitchen sink like I did because even if you have hosed off your shells, a lot of sand will still come out of them, which your plumbing pipes will NOT appreciate! Many of the shells will still have the two sides attached; gently pull the flat and cup sides apart as you clean. 4 | DRY. Place the shells in a single layer in the sunshine to dry. A big drop cloth on your deck, driveway, or lawn will do the trick. The sun will brighten them up a bit more too. 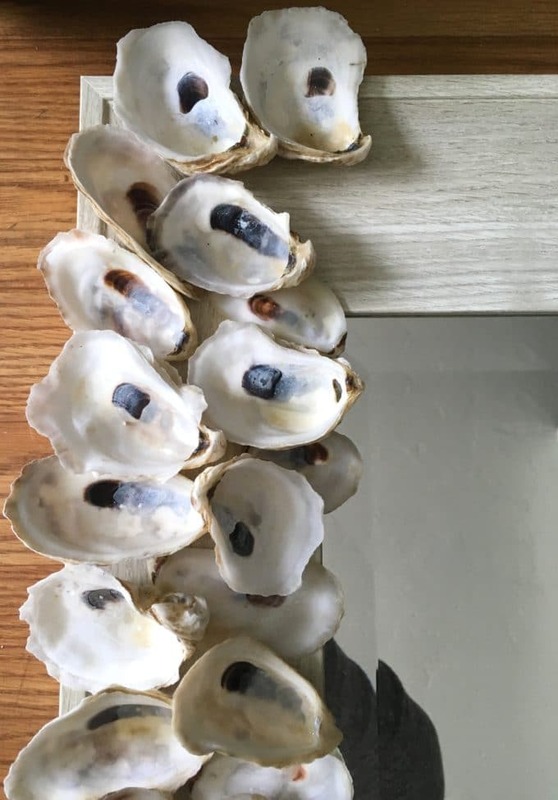 The difference before and after cleaning and brightening up the shells is amazing – all your efforts will unveil the natural beauty inside the oyster shells. 1 | THE MIRROR. You’ll need a relatively flat-profiled and lightweight mirror. 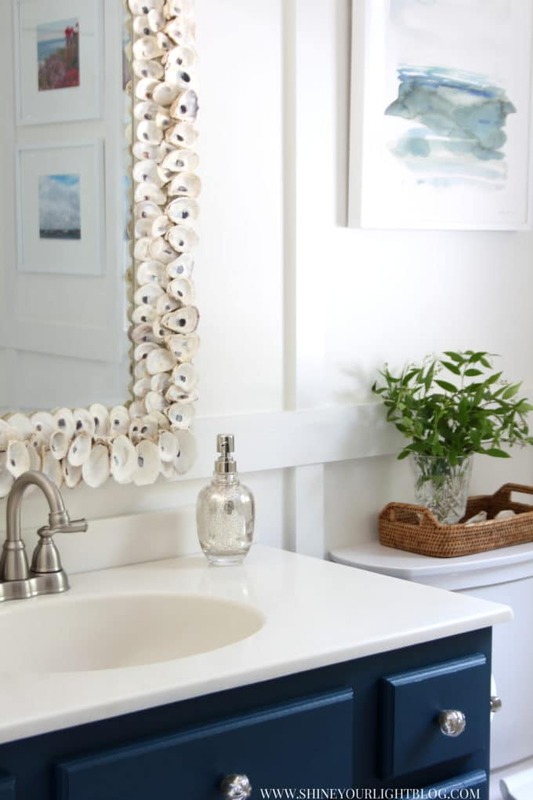 Make sure your mirror has hanging hardware already attached because once the shells are on you won’t be able to place it face down, or stand it up if your shells overhang the bottom edge like mine do. 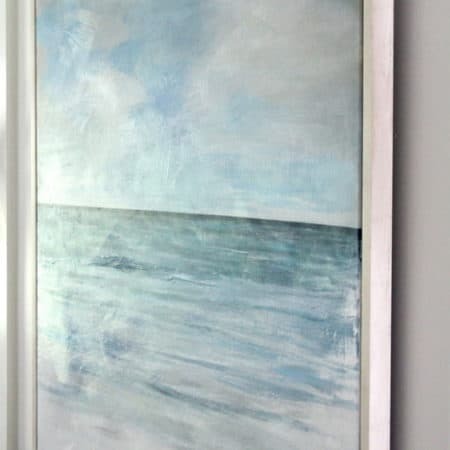 I LOVE these cleat-style hangers – they make hanging an awkward piece (like a mirror with sharp jagged edges!!) SO much easier!! I also used this style hanger for our heavy foyer mirror and to hang our DIY upholstered headboard on the wall. 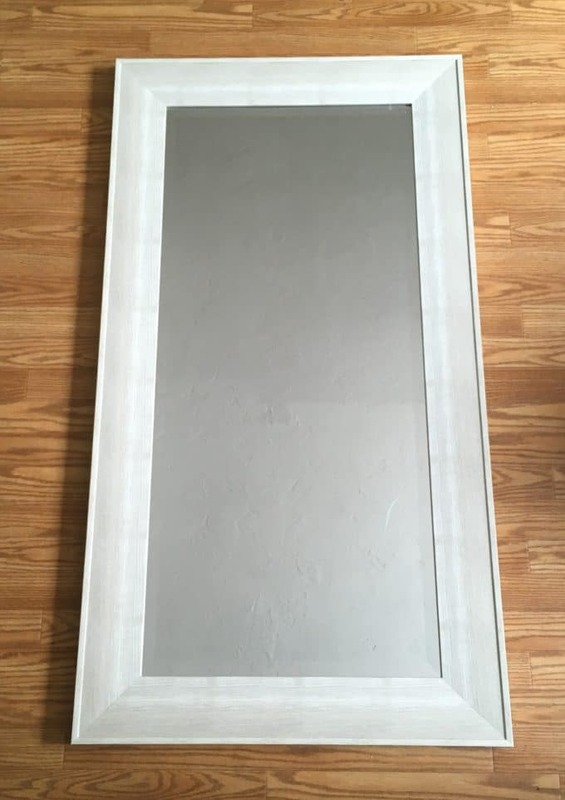 I picked up this inexpensive mirror at Homegoods specifically because I thought that faux-wood finish would blend well with oyster shells, but a white or cream framed mirror works well too. 2 | FIND A WORKSPACE where you can make the mirror and then leave it to dry for at least a day. I worked on a corner of my kitchen floor which was not ideal when it came time to dry! 3 | FIGURE OUT YOUR DESIGN PLAN. Before you start gluing, play around with the placement of the shells and have an overall plan of attack. 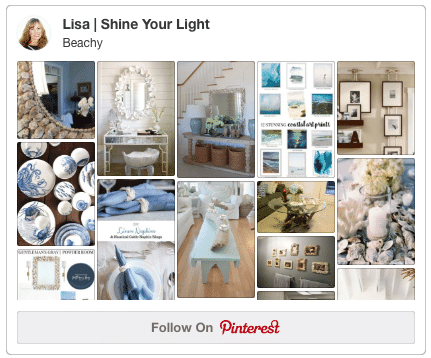 If you need more inspiration, check out my “Beachy” Pinterest board for a ton of different shell mirror designs. Some of them are true works of art!! 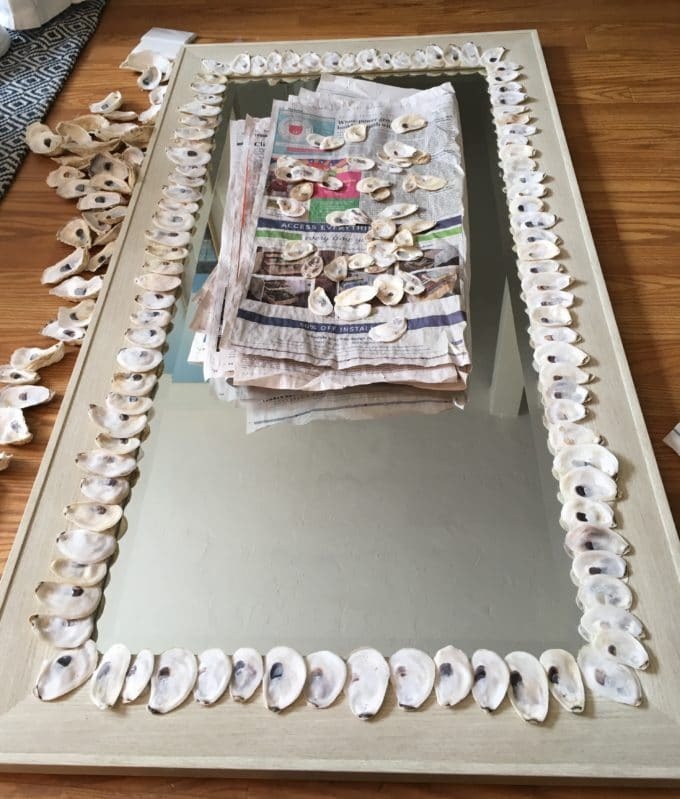 I was planning to use only the “cup” shells and not the flat sides, but I found that the flat ones were great for layering so I placed those all along the inside edge, overlapping them and covering a bit of the mirror. Then I used the “cup” shells on the outer edge. For best adhesion I found it was best to put a generous amount of Liquid Nails on each cup shell where it would be coming in contact with the mirror, rather than putting the LN on the mirror and placing the shells on top of it. The corners needed another layer to hide the frame. After the inner and outer edges were done, I used more of the flat shells to fill in the gaps between them. Make sure to wipe any excess Liquid Nails off the shells before it dries because it’s impossible to remove after!! If there is any adhesive on the mirror, let it dry and then use a new utility blade to carefully scrape it off. 4 | ALLOW THE ADHESIVE TO CURE for at least 24 hours before hanging. 5 | HANG. A second set of hands is highly recommended for hanging!! – shell mirrors are awkward to lift since all the edges will be jagged, so be careful. The cleat hangers are excellent for hanging heavy and awkward pieces like this. Mark deserves a some kind of special award for hanging not one, but two shell mirrors with me! Now stand back and enjoy your jewels of the sea! 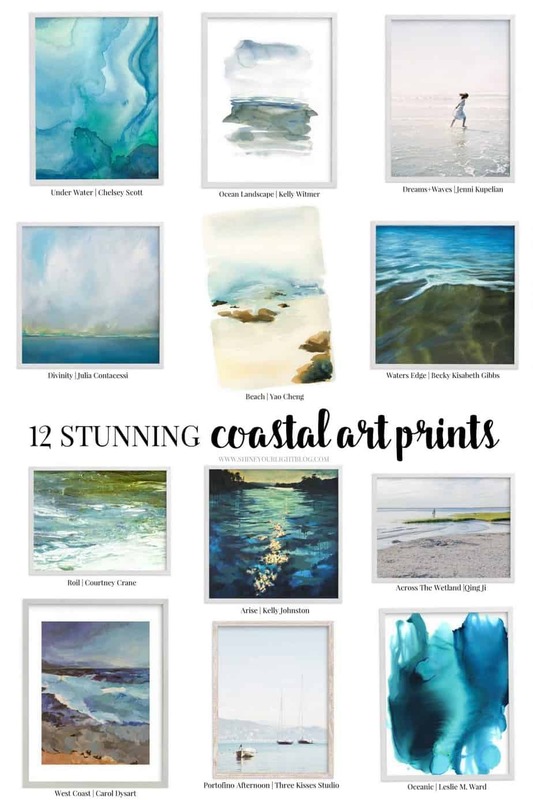 If you’re drawn to the sea like me, you might enjoy this roundup of beautiful coastal prints. I adore Dreams & Waves by Jenni Kupelian (upper right corner), where can I use it in my house??? 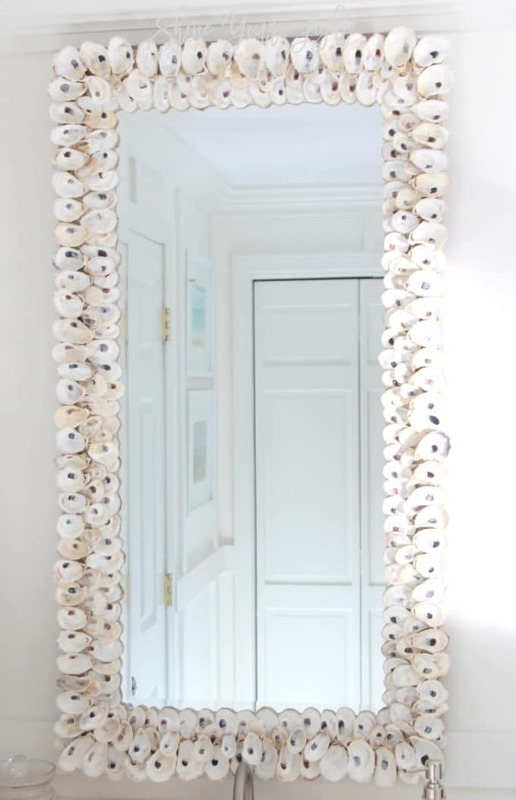 What do you think – would you make a shell mirror? Making one is really not that hard, just requires a little time, but it’s oh so worth it! may your joys be as deep as the ocean! It looks amazing. 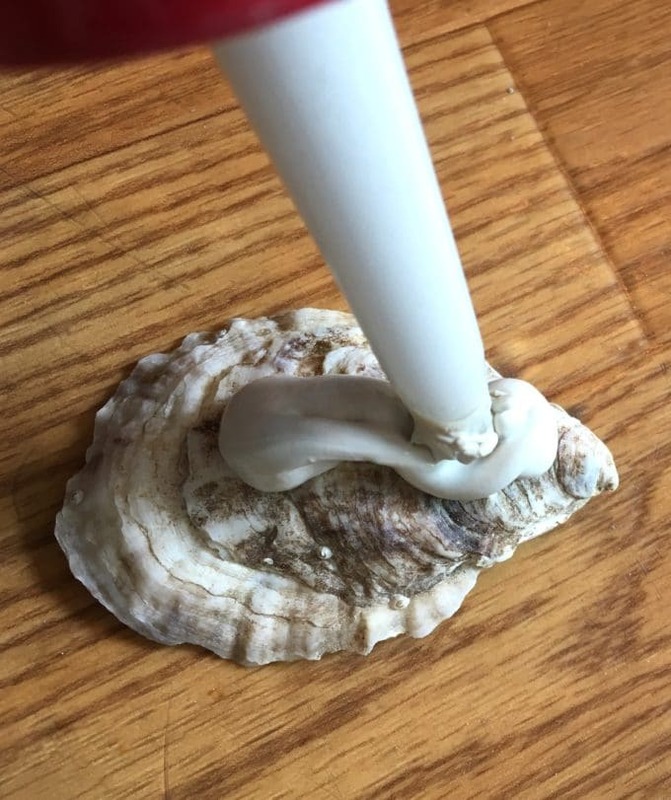 I too did a shell mirror with hot glue…ouch!! But, so worth the burnt fingers in the end. Yes I remember that from my first mirror too Lauren! I guess that’s another upside to using the Liquid Nails! Just beautiful Lisa! The difference in the shells after you cleaned them is amazing!! Great job friend! 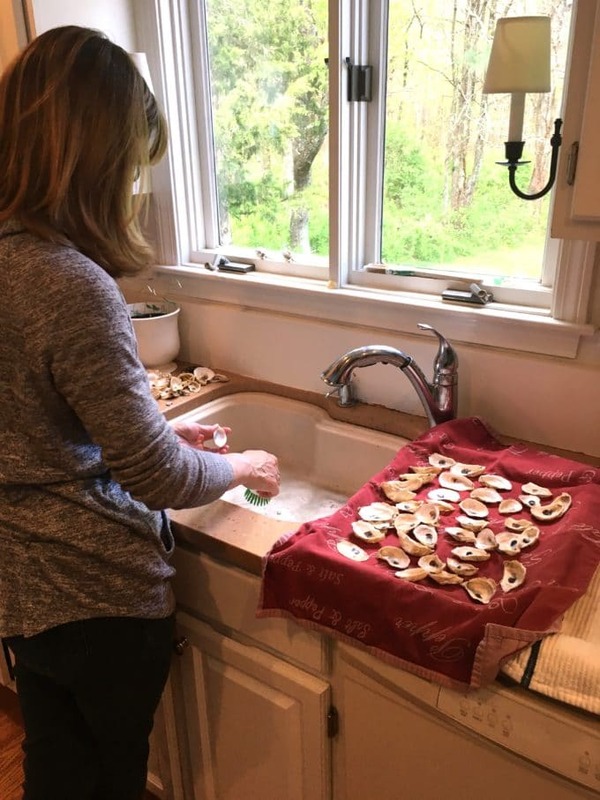 It’s funny Denise, when I saw the shells at first, I thought there was no way they were the “variety” that are pearly white and pretty, so I had little hope that scrubbing them would help much. I couldn’t believe how pretty they were after! Thanks as always for your kind works my sweet friend! 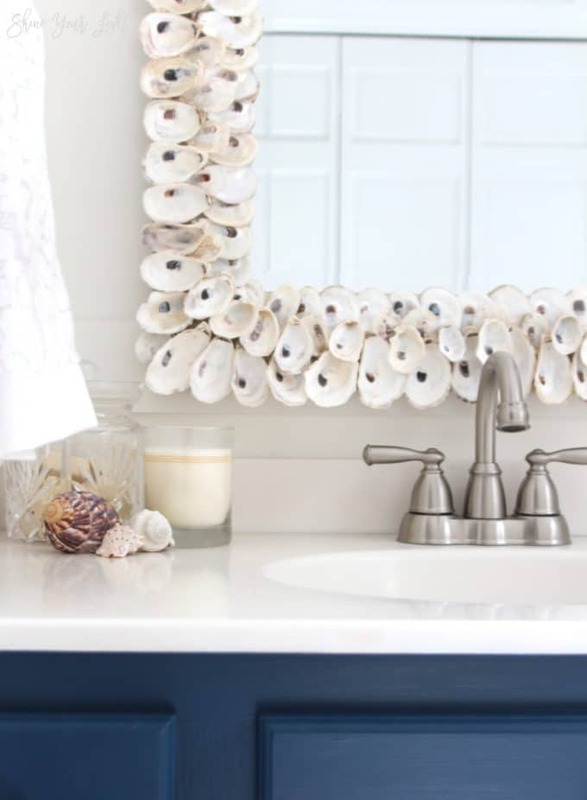 The mirror definitely brought the “sea” to your beautiful coastal bathroom makeover! 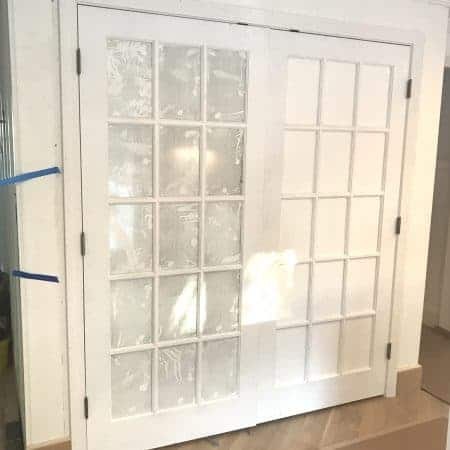 Another great DIY project my friend. Looks great! You’re the sweetest!! Thank you SO much Carol….your comments always brighten my day!! I LOVE that mirror! Just pinned that ….I will have to make one at some point:) Thanks so much! Kathleen thank you! It is actually easy to make, if you do one I’d love to see!! LOVE the mirror. Glad to see that making it is easier than it looks!! Would love to do one someday. 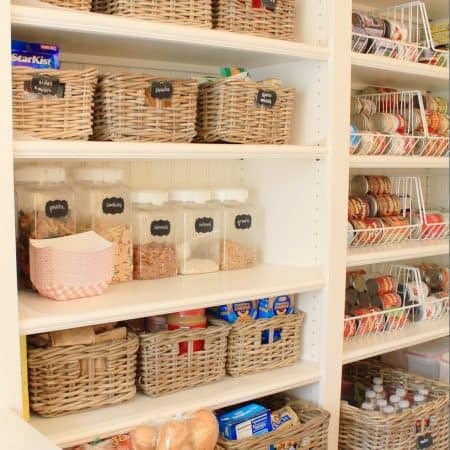 Also, who cares how many beachy things you have in your house. We live in NC, a good 4 hours from the ocean, but my house looks very beachy! !